When I bought our current house, there was an old shed on the property. It was functional, but not much else. It gave the lawnmower, garden tools, and trash a place to keep dry but definitely not in style. Even worse, the shed was listing to the side! So, I need to level and rebuild our garden shed. When I inspected it, there was no sill plate connecting the 2×4 stud walls! I also need to replace the sheathing for the bottom foot of the roof because there wasn’t drip edge flashing installed either. 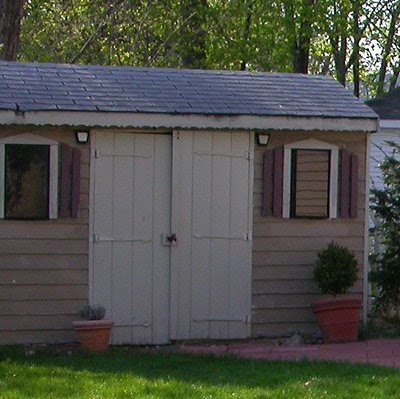 The shed was definitely a home center purchase that was cheap and set up on site quickly. After addressing the main problems, I wanted to fix a few other things. Namely, the door was a little too narrow, and I didn't like it in the center -- it would be more useful to have it on the side. In addition, it had two windows, or faux windows I should really say -- they had plexiglass panes and didn't really open. 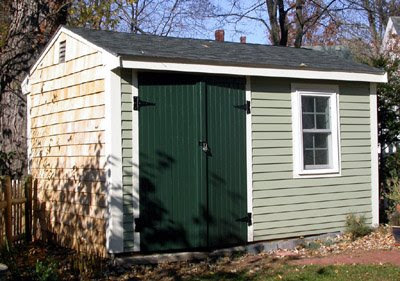 All-in-all, the shed didn't really complement our 1890 Victorian house. I wanted to add a single real window to the right of the door. Since we had a new roof put on the house last fall, we had plenty of extra architectural shingles to redo the shed with the same. I used clear cedar clapboards on the front and cedar shingles on the sides. I made some new doors out of T&G pine and reinforced with a "Z" pattern on the back of the door to keep the boards in place. I think the final result come out nice. The before and after photos show what I did to get things in shape. Hopefully this shed will last a lot longer since I fixed it before it fell down or got too rotted and damaged. I need to take some follow-up photos of the shed once I fix up the landscaping around it -- but that's another project unto itself!